Hello there! Anyone still around? It’s been a month since I last posted…a month. Where did the time go? What, in heaven’s name, was I doing? Will get to that in a bit. Meanwhile, I can say one thing that I definitely was not doing…not thinking about this blog. Believe you me, it was on my mind constantly, like a wonderful friend who lives on a paradisal island that I was just aching to visit and play with…but because of lack of resources and time, just couldn’t get to, no matter how much I longed for that escape. – Preheat the oven to 335 degrees. Grease cookie sheets or line with parchment paper. – Sift together the flour, baking soda and salt; set aside. – In a medium bowl, cream together the melted butter, brown sugar and white sugar until well blended. – Beat in the vanilla, egg, and egg yolk until light and creamy. Mix in the sifted ingredients until just blended. Stir in the chocolate chips by hand using a wooden spoon. Drop cookie dough a rounded tablespoonful at a time onto the prepared cookie sheets. Cookies should be about 1 inch apart. – Bake for 12-13 minutes in the preheated oven, or until the edges are lightly toasted. Cool on baking sheets for a few minutes before transferring to wire racks to cool completely.The original recipe called for 1 cup semi-sweet chocolate chunks from a high quality chocolate bar (like Vahlrona or Green & Black’s). I didn’t have any so I decided to use a half cup more of my regular chocolate chips to compensate. I am definitely trying this with swanky chocolate chunks next time! I also made the cookies smaller (you use a 1/4 cup measure to mold the cookie dough in the original) to make more cookies — and feed more neighbors! 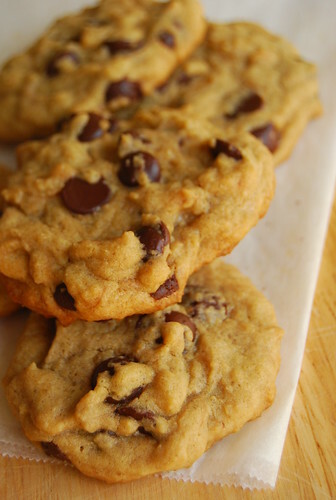 These are absolutely classic tasting chocolate chip cookies — chewy with slightly crispy edges and gorgeous shots of chocolate all throughout. You can be sure I kept some for myself! I hope this recipe appeases you until I pop back here again. I can’t promise when that will be. You see, aside from the renovation and work (and the holiday rush! ), there is also much going on in these parts — of which I hope to share with you soon! For today though, these cookies will have to do. They’re very good and I’m sure they will keep anyone happy 🙂 I certainly hope they keep my neighbors in good spirits as the carpenters hack away! Hi Shelby! Thanks for visiting 🙂 Hope you enjoy the cookies! I just came across your blog when I was looking for some high-class cooking blogs and I think you fit into that category. 🙂 I have a cooking/learning to cook blog of my own that I've started for a class of mine. I would really- and I do mean REALLY- appreciate it if you could possibly check it out and comment. I would love to get your feedback on my project and get any favorite recipes that you might have! I need people to comment on it for a grade, so it's kind of important and who better to comment than a cooking enthusiast? 🙂 Thank you so much! wow , this must be really good. Great i should try this out!